C.J. Erickson Plumbing Co. to Participate in Rebuilding Together Metro Chicago Event on April 30, 2016 | C.J. Erickson Plumbing Co. Rebuilding Together Metro Chicago is a volunteer organization that dedicates itself to improving the homes and communities of elderly, disabled and low-income residents. They partner with volunteers, communities, corporations, trade unions and service clubs to help these disadvantaged homeowners. Every year, on the last Saturday in April, Rebuilding Together Metro Chicago celebrates National Rebuilding Day with an ultimate event in the home repair program. C.J. Erickson Plumbing Co. is proud to once again be participating in National Rebuilding Day, which will be held on April 30th, 2016. 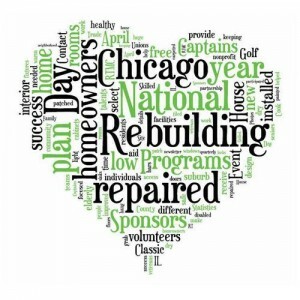 To prepare for this event each year Rebuilding Together Metro Chicago recruits and trains sponsor teams, identifies and screens homeowner applicants, raises private funds for building materials and rallies over 3,500 volunteers to donate their efforts. This year, C.J. Erickson Plumbing Co. is a sponsor of a home being repaired in Blue Island. This will be an ambitious project that will require 20 to 25 volunteers. We are honored to continue to sponsor such a wonderful event. For more information or to support Rebuilding Together Metro Chicago visit http://www.rebuildingtogether-chi.com.